You are here: Home / Projects / Fundraising / Team INVNCBL were awesome! Hooray! We have had all sponsorship in (but more is always welcome 🙂 ) and I am pleased to say that our awesome team effort has so far raised £502 exactly! That is really exciting as summer is starting and surf sessions will be back down the beach at Caswell Bay in the next couple of weeks and we can carry on with blocks, possibly even have two going at the same time depending on numbers. We had a fantastic day at Margam park on the 18th. It was a lot windier and chillier than we anticipated but the 12 of us set off in our lovely blue Gumby Legacy shirts – logo beautifully designed by Cath Grice. I think we were all (except for Gareth!) fairly anxious to begin with but there was no need which we soon discovered. 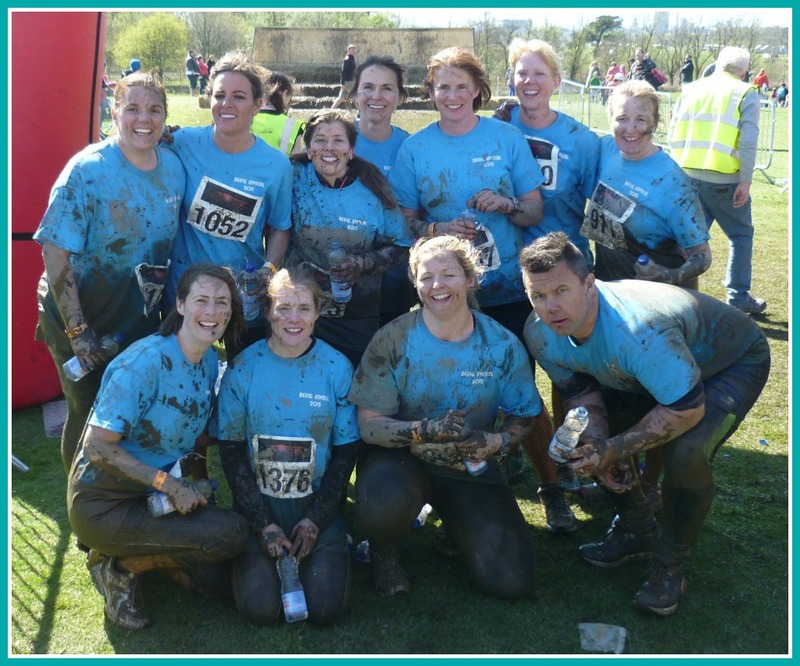 This was the first event I have ever done where the whole group completed the entire race as a team – it was absolutely brilliant and we all thoroughly enjoyed it. It was muddy, hilly, smelly, muddy, wet, tough, muddy and a bit dangerous. Did I mention muddy?! The course started off by going quite a way out of the easily accessible park grounds which was unfortunate for spectators. I cannot tell you how wonderful it was when we finally got back down into the main park to see friendly faces cheering us on, letting us know there wasn’t much more to do. There were a couple of incidents but thankfully nothing serious. We were all slightly concerned, ok – a lot, after Gary’s shin came up with a swelling the size of a golf ball (at least). Apparently just a random swelling (?!) and not a break which we all secretly thought it had to have been. Luckily for us, the ankle breaker water slide had been closed by the time we got to the lake (4 suspected ankle fractures) but the other slide was still open, resulting in me having a hole ripped through my trousers, nickers and bum- thank goodness for x-large shirts and race numbers needing safety pins is all I can say! Considering the long waiting times at many of the obstacles and the fact that much of the course was far too hilly and steep to actually run, we all completed together in a very respectable 2 hours 45 minutes, already talking about signing up for next years event. If you click this you can check out some more photos. There were some very pretty bruises to show over the next week and a lot of stories to tell, backed up by the photos I managed to take as we went around with a camera that miraculously survived. 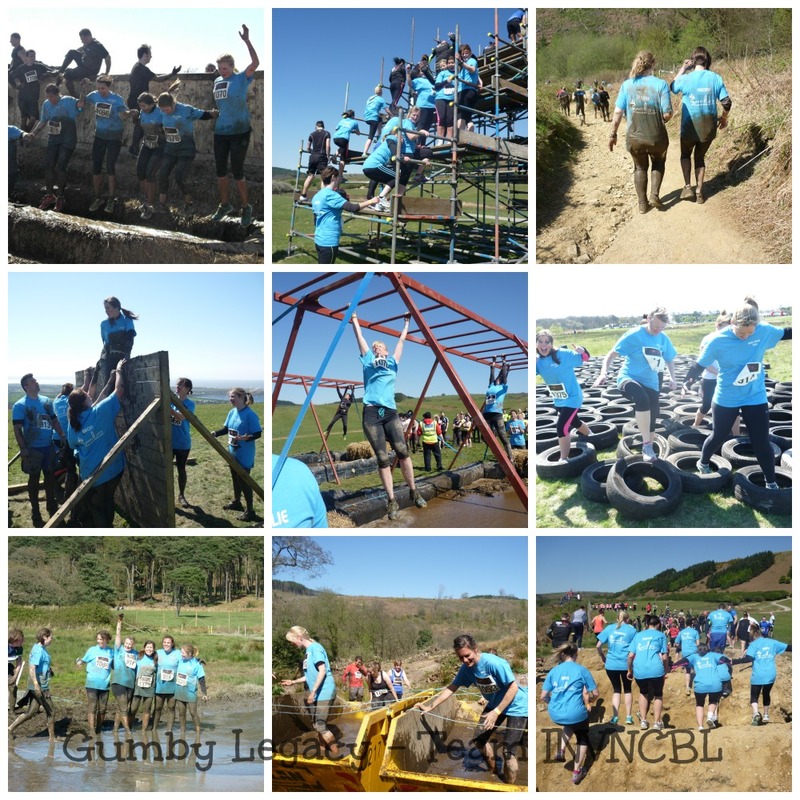 Thanks again to Naomi for starting the ball rolling and to each and every one of Team INVNCBL for doing something so out of your comfort zones. 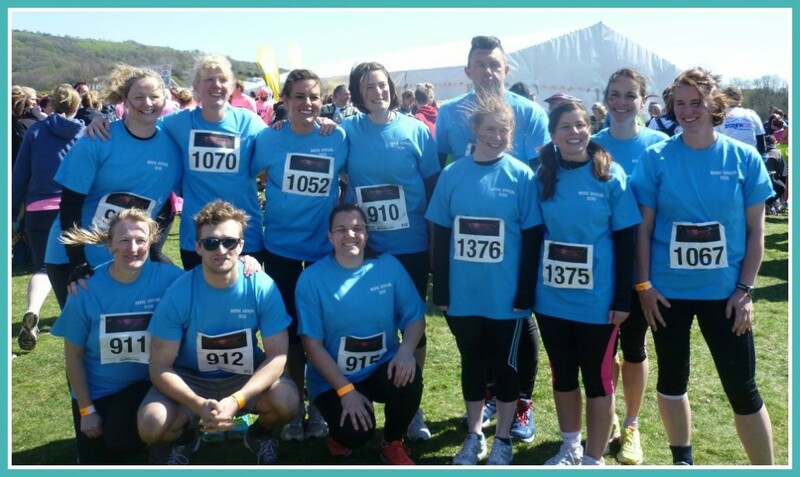 Thank you so much to those of you who sponsored us and supported us. £502 is a fantastic amount to have raised and will make a big difference to many more kids. The question now is: What’s next and whose doing it with me?? ?